The rapidcount T Series processes medium to large quantities of banknotes quickly and with high security. Through the powerful banknote feeder, not only can 300 banknotes be loaded at a time, but they can also be added during operation. At up to 1,200 banknotes/minute (T 275b), the total daily receipts are counted within seconds. Depending on the model, perform a simultaneous comprehensive counterfeit detection. While the T 225 recognizes the authenticity of the counted banknotes based on their UV features, the T 275/T 275b additionally checks the IR and MG features. For even higher counterfeit detection security the T 275 and T 275b check the magnetic codes. The magnetic code is the most foolproof feature of the euro banknotes. If it is missing, be sure that the T 275 and T 275b will find them. This combined testing provides you with secure protection from counterfeit money and an investment with added value. The T 225, T 275 and T 275b save users additional valuable time, since they accurately count and check unsorted notes. 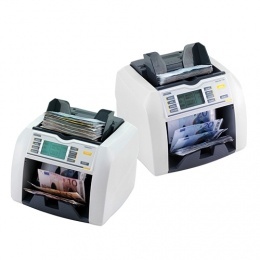 Time-consuming pre-sorting of earnings becomes a thing of the past; simply equip the banknote feeder with the bundles from the checkout. The complete detailed payroll result is displayed at the push of a button upon successful counting. Thanks to its up to 20% faster counting speed and maximum annual run of 1.2 million counted banknotes, the T 275b is the premium model of the rapidcount T Series. Its professional features make it ideal for usage in banks. All models of the rapidcount T Series additionally feature a practical start/stop function, as well as a bundling and addition function for simplified and smoother counting processes. The compact housing with dimensions of only 26 x 28 x 26 cm allows the device to be utlilised in cramped conditions and also easily transported and flexibly used within companies and retail shops.